We'll start by adding a simple square 2D object to your scene. Select the 'Home' ribbon category. 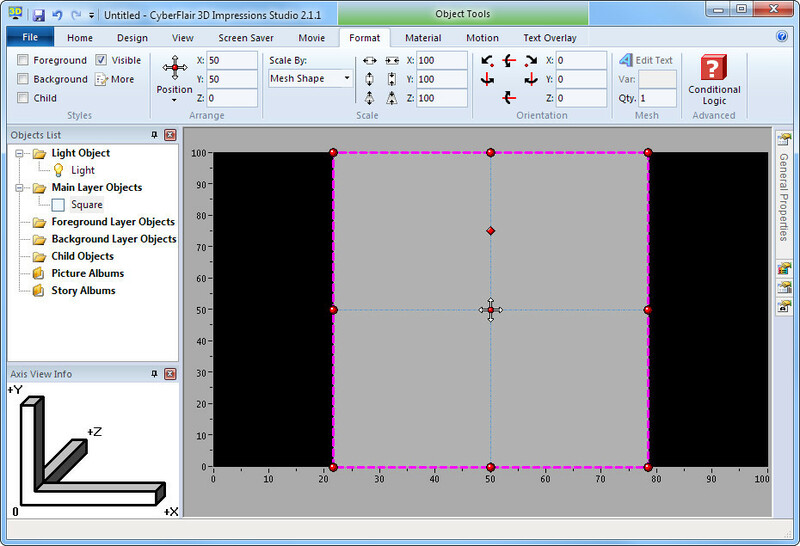 Click the square shape within the collection of 2D objects. New object is added in the 'Objects List' window. Here you can also select other objects within your scene. Ribbon automatically switches to the 'Format' category when an object is selected. Currently selected object is highlighted with a thick, dashed, pick border. Selected object can be moved by grabbing this central icon with the mouse. Object names are useful for distinguishing between which object does what. To rename the selected object you can either press F2 on your keyboard or use the '(Name)' property available within the 'General Properties' tool window.